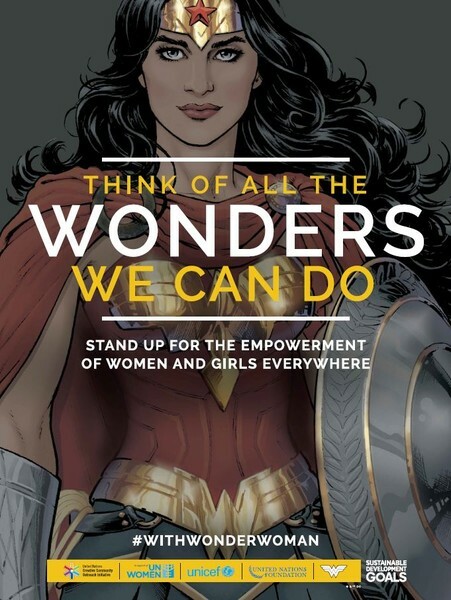 On Wonder Woman’s 75th anniversary, the United Nations appointed the super heroine as an Honorary Ambassador for the Empowerment of Women and Girls. 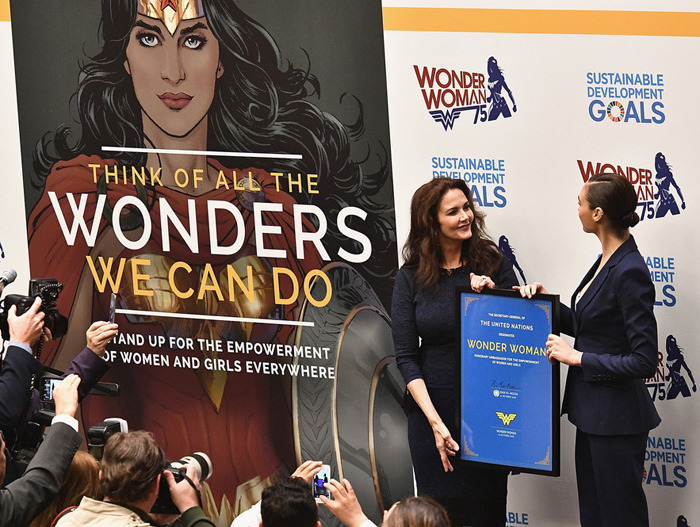 It seemed like a great public relations move for the UN and for Warner Bros., who made sure that Wonder Woman movie star Gal Gadot and TV star Lynda Carter were on hand for the ceremony. As an unabashed Wonder Woman fan, I was thrilled. Not everyone was so excited. 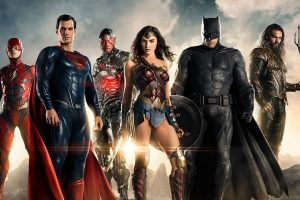 Over one-hundred UN staffers protested the appointment at the UN, and over one-thousand have signed an online petition against the fictional superhero receiving the honorary appointment. They cited Wonder Woman’s body proportions, revealing outfit, and race as reasons that the heroine was not an appropriate choice for the post. 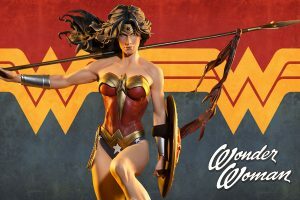 “It is alarming that the United Nations would consider using a character with an overtly sexualized image at a time when the headline news in United States and the world is the objectification of women and girls,” they declared on the petition. They argued that it was inappropriate to nominate a fictional character when there were many real women to represent and speak out for women and girls. The American flag themed outfit was also mentioned in their issues. I understand their issues with having Wonder Woman as an ambassador, but let’s look at the issue more closely. Wonder Woman is not the first fictional character to be named an honorary ambassador. The UN has been nominating fictional characters to honorary posts for almost twenty years. Winnie the Pooh, Tinkerbell, and Red, the leader of the Angry Birds in the mobile game, have been named Honorary Ambassadors. 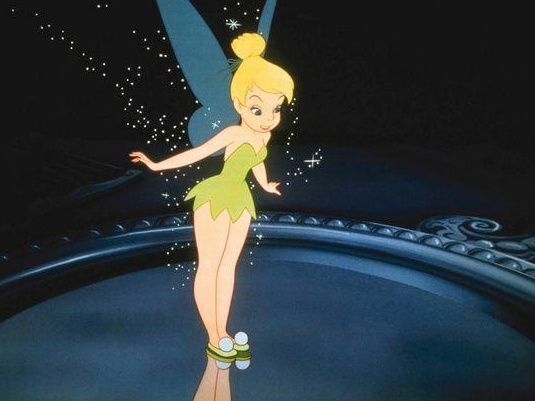 I think it can be argued that Tinkerbell’s outfit is just as skimpy as Wonder Woman’s, and she’s just as white. Diana’s image has been used as an international symbol for women’s rights, breast cancer awareness, and countless other female causes. Why is she less worthy than a red bird from a mobile game or a bear who struggles to spell “honey” correctly? I guess the UN likes skin-tight black leather better than red and blue leather? Since the early 1950s, the UN has named “prominent personalities” (read: celebrities) as ambassadors to highlight key issues and draw attention to their efforts. They have named Nicole Kidman, Emma Watson, and Ann Hathaway as official Women’s Goodwill Ambassadors. They are all icons of beauty, and are all very, very white. The idea behind nominating famous individuals is to draw attention to the issue. Despite speeches and trips, their real power is in their ability to generate headlines. I would argue that Wonder Woman, despite being a fictional character, has that same power. How many young girls, comic book fans, and curious internet wanderers paid attention to this event simply because it was Wonder Woman? How many MORE people paid attention because of this controversy? I’d be willing to bet that more people became aware of the UN’s support for women’s rights because of Wonder Woman’s appointment than due to any other ambassador they’ve named for that cause. The whole point of naming “honorary” and “goodwill” ambassadors is for the PR, and Wonder Woman has already been wildly successful at drawing attention to this issue. I think, of all the arguments these protesters have made, the one about her outfit upsets me the most. Different cultures have different ideas of what is acceptable and what they believe is beautiful, but shouldn’t the idea of female empowerment include a woman’s right to not be judged by what she wears? A woman in a bathing suit should be as respected as a woman in a business suit. Saying a character isn’t a good representation of female empowerment because of her clothing runs completely counter to how true female equality works. The power should be with the woman, not those around her to observe and judge. This character was designed as a feminist icon from the beginning. She was the first prominent female superhero that was completely original and not a derivative of a male character, such as Supergirl and Batgirl. Her character biography has changed over the years, but she’s always been able to go toe-to-toe with the world’s most powerful heroes and emerge victorious. She represents a thriving all-female culture that isn’t in need of male saviors or caretakers. These protesters should look past her star-spangled briefs (now updated to a Roman-inspired leather skirt) to what the character really means to her fans. 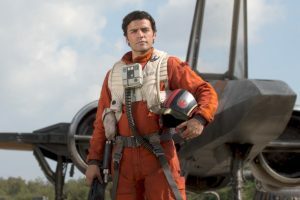 I’ve walked the convention floor dressed as this character. I’ve seen the excitement on little girls’ faces when they see me. They proudly wear their tiaras and flex their muscles with me. 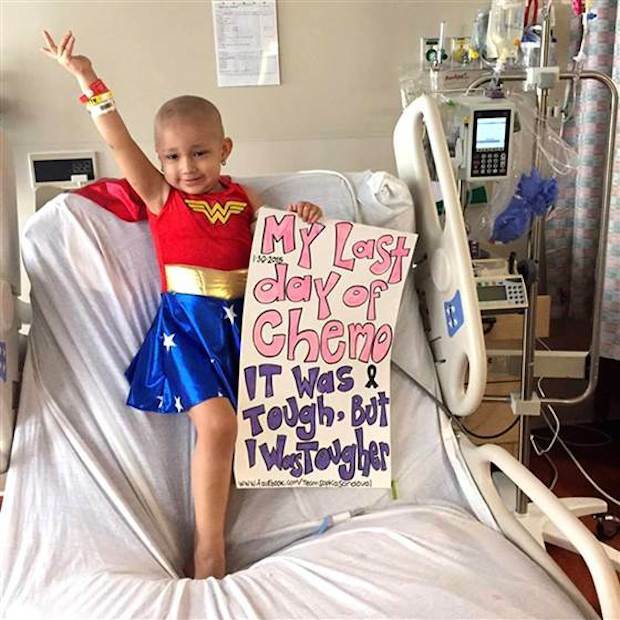 In a world that is dominated by love-obsessed Disney Princesses, Wonder Woman shows young girls that they can save the world.